This is Cayman's finest dive centre facility. The Ocean Frontiers specializes in East End diving and snorkeling - consisting of new boats (finest in the Caribbean), training pool, classroom, photo center and a technical diver facility. Definitely a modern dive operation that offers free shuttles from anywhere on the Grand Cayman Island. Ocean Frontiers has a new 38' long, 14' wide, custom built, all aluminum, deep sea Catamaran. This Catamaran was built especially for Cayman's East End waters and is able to reach remote sites at up to speeds of 30 mph on any day. The Nauti-Cat is a state-of-the-art craft with diver-friendly jet drives, protected camera table and large fresh-water rinse tanks. 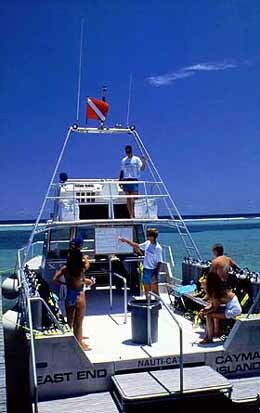 Then there is the "Cat-A-Pult" a one of a kind custom built dive boat which is very fast and perfect for private charters. The Reef Seeker is a monohull 42-foot custom dive boat with the same facilities and amenities as the Natui-Cat, including diver-safe jet drives. Whether you are an experienced diver and/or a novice... in search of a wall dive, reef dive, stringray dive or snorkeling trip - Ocean Frontiers is the Diving Center for you. There is a camera table, water, lemonade, marinehead and all the niceties you are accustomed to. For experienced divers there is unguided computer diving available. There are 2-tank dives seven days a week both mornings and afternoons. Night dives are offered on Tuesdays and Thursdays and Stingray City on Fridays. A shark awareness dive is offered on Thursdays and Saturdays and snorkeling trips are offered on Tuesdays and Wednesdays. Free courtesy shuttles are available and there is plenty of parking space. There is a private beach for your after dive use and a Ocean Frontiers is a full Scubapro Dealer and offers some equipment duty free. 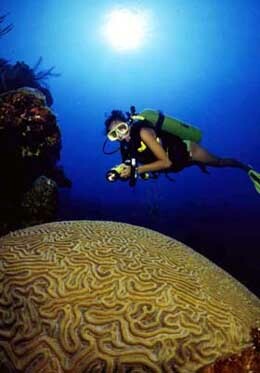 Ocean Frontiers is located in the heart of East End - only 10-20 minutes from most dive sites. This is a modern dive operation with old style Caymanian hospitality. Whenever you want to dive Cayman's East End... just call. The Ocean Frontiers' staff loves to dive the East End and strives to keep it exciting while remaining relaxing and fun. This is a small company that works at pleasing. For information and reservations call: 800-544-6576.